See below for more reasons why. My graphic recording pricing is based on whether you’re a non-profit or a profit, and whether you want a day-long session or half-day session. Ballpark-wise, you won’t pay less than $500 a session or more than $1100 a session. We can talk. I do pro bono work for causes close to my heart, and you guys already know who you are. 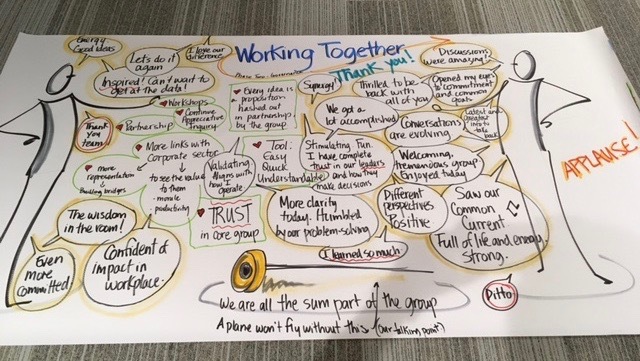 I had a chance to work with Susan as a graphic recorder on a creative conference session we presented to a group of national marketing and advertising executives. Susan provided the creative approach we needed, taking the session content and discussion and making it visual and appealing. This approach was exactly what was needed to take this session to the next level and was a perfect fit for our creative audience. Our delegates loved it! Can’t wait to have the opportunity to work with Susan again. I once again wanted to thank you for the wonderful graphic illustrations from OMISTA’s Strategic Planning session. At this week’s management meeting we used them to help remind us of all the great conversations we had. They are excellent for reminding us of small details that we don’t want to lose sight of. We have also displayed them in the hallways of our Head Office. They are a HUGE HIT and are generating lots of great energy and conversations with our employees. They will be making their way to all of our branches for all employees to see and enjoy.